All is not well at the Wenley Moor underground atomic research station: there are unaccountable losses of power-output; nervous breakdowns amongst the staff; and then - a death! UNIT is called in, and the Brigadier is soon joined by Doctor Who and Liz Shaw in a tense and exciting adventure with subterranean reptile men - Silurians - and a 40 ft. high Tyrannosaurus rex, the biggest, most savage mammal which ever trod the Earth! 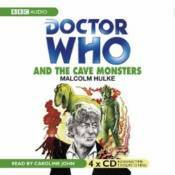 Caroline John, who played Liz Shaw in the original TV serial "Doctor Who and the Silurians", reads Malcolm Hulke's complete and unabridged novelisation, first published by Target Books in 1974. 'They're well-written books - adventure stories of course, but with some thought...the creation of the character of the Doctor had a touch of genius about it.' - "Westminster Press".